The Gamma Alumni Association (originally established as the Baton Rouge Area Alumni Chapter) existed informally for a number of years before being officially recognized and chartered in the summer of 2010 by the Headquarters of Kappa Sigma in Charlottesville, VA. The earlier group met fairly regularly for lunch and to share their personal memories of their days as undergraduates in Gamma Chapter. In reviewing the intended role of the new organization, it was determined that a name change to the Gamma Alumni Association would be best. As the association grows, the group in Baton Rouge will, hopefully, be the first of many such alumni groups who will be meeting statewide in Louisiana, as well as outside the state. There will be many opportunities for our alumni Brothers to be involved in providing encouragement and support for Gamma Chapter. Numerous programs and activities are being planned, and a significant number of alumni will be needed in order for success to be realized. As the association continues its involvement with the chapter, it is hoped that those Brothers who graduate will desire to become involved in our efforts. 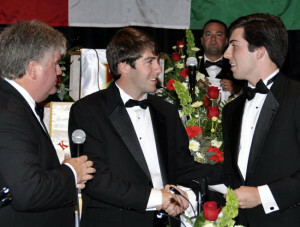 Brother John Woodard (right) receives one of the Kappa Sigma Scholarships from Gamma Home Corporation President, Brother Chip Weimar (left) and the 2012-2013 President of the Alumni Association, Brother Adam Vegas (center) presented during the Founders Day Dinner as part of the 125th Anniversary Celebration weekend. The Gamma Alumni Association will sponsor and coordinate several awards and recognitions to be presented annually at the Founders Day Dinner or at other specified events. These awards will include various scholarships to be presented to deserving undergraduate Brothers. In addition, the association will be involved in or co-sponsor additional activities and projects for and with Gamma Chapter.